Two web development languages couldn’t be any more different from each other in ways than the two already popular programming languages, Python and PHP. Both Python and PHP are arguably the most preferred choices of programming languages when it comes to backend web development. Despite the fact that almost 80 percent of the websites today use PHP, Python has a little edge over PHP on various parameters. Both are high-level programming languages commonly used worldwide for web development. Wed development is arguably one of the most sought-after skills today and almost any organization, whether small or big, requires a business website and a mobile app – both of which require backend development. However, the market is flooded with so many programming languages, so choosing the right programming language from many gets a little difficult. Same is the case with Python and PHP. The question remains – which one is better, Python or PHP? Python is a high-level, general-purpose programming language used for both standalone programs and scripting applications in a wide variety of domains. Python was originally created and developed by Guido Van Rossum in the late 1980s. Touted for its simplicity, dynamics and robustness, Python, in a very few years, has grown to be one of the most widely used Web and system scripting languages. It is open-source, powerful, portable, and is both relatively easy and exceptionally fun to use. It is interpreted and object-oriented with an enormous library support. It is still one of the most popular choices of backend programming among the community. Python clearly outsmarts PHP in the elegant way it handles namespaces. The code written in Python is more readable than any other programming language including PHP, Perl, Ruby, and so on. Developed by Rasmus Lerdorf in 1994, PHP, short for Hypertext Preprocessor, is one of the most popular server-side scripting languages and is a revolutionary step in online scripting. 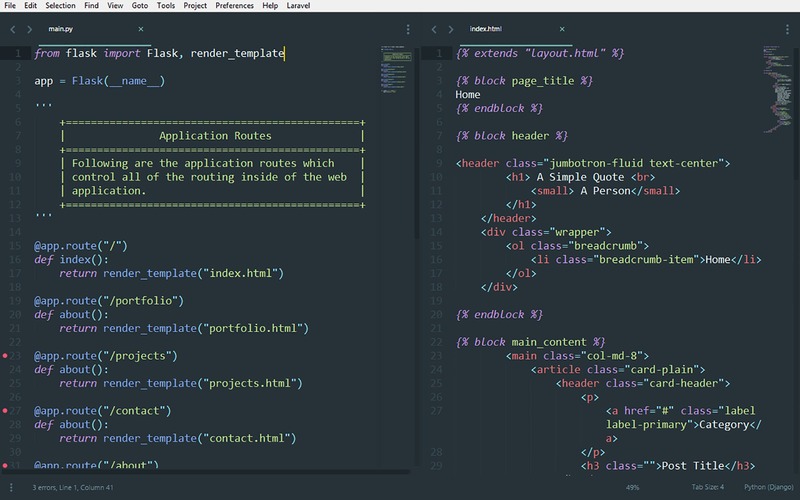 PHP is a simple yet powerful language designed for creating HTML content over the Web. As such, it contains many native features that make that task easier. PHP has also become immensely popular generating XML documents, Flash animations, graphics, PDF files, and so much more. The paths to using PHP are many and varied, but the single most foremost reason to stick with PHP is its ease of use. 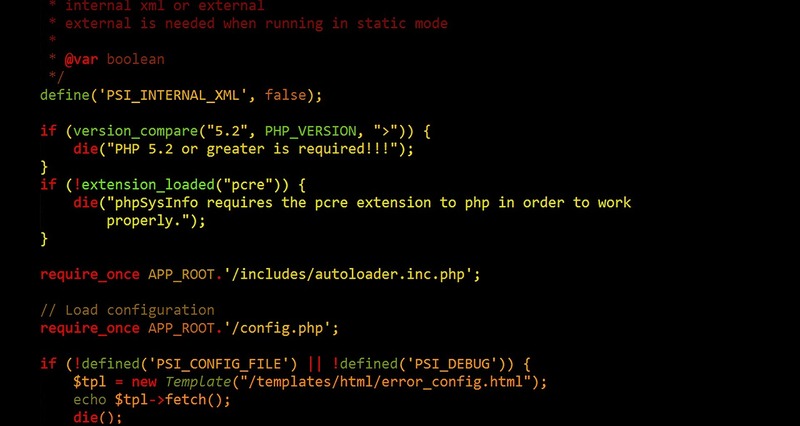 Thanks to the PHP version 5, web developers can now add the power of a robust but uncomplicated object-oriented language to their arsenal of web development tools. The best part, it runs of all major operating systems, including Linux, Ubuntu, FreeBSD, Debian, Solaris, Windows, and Mac OS X.
Python is open-source, powerful, portable, and is both relatively easy and exceptionally fun to use. It has more features than any other programming language and is easier to learn and use. The syntax is much simpler and the code written in Python is more readable than any other programming languages including PHP, Perl, Ruby, and so on. PHP, on the other hand, wasn’t designed to be a general-purpose programming language; in fact, it was originally designed to create dynamic web content and is still the best scripting language for that task. The single most foremost reason to stick with PHP is its ease of use. Both the programming languages have an active and vibrant community of programmers worldwide. Python is relatively new to the scene and is a rising star in CGI scripting. In a few years, Python has grown and matured enough to be one of the most widely used Web and system scripting languages. PHP, on the other hand, is a relative newcomer to the Web-scripting scene but has been around for quite some time now. PHP is much more powerful language than when it was originally released, but it provides the same extensibility features. Both Python and PHP are powerful, mature programming languages with excellent community support and documentation. Python is a clear winner when it comes to documentation. The documentation and tutorials available to aid in the learning process are transparent and much clearer than those available for PHP. Python programs are much shorter and easier to write compared to other programming languages including PHP. Python, however, doesn’t have a steep learning curve. The documentation of PHP is available free of cost online, as it is released as part of an open source license. However, both the languages are accompanied by detailed and extensive documentation. One of the major differences between the two programming languages is their orientation. Python is a high-level scripting language that supports both project-oriented and procedure-oriented programming, which means it efficiently separates the functionality of a program and divides the program into several sub-modules. PHP, on the other hand, is object-oriented that allows developers to group several tasks into containers which are defined using classes in PHP. The main purpose for PHP on the Web is interoperability with other resources. Both Python and PHP are undoubtedly the most preferred choices of programming languages when it comes to backend web development, but they have their fair share of distinguishing points. For one, PHP is based on object-oriented programming, whereas Python supports both project-oriented and procedure-oriented programming. Python is a general-purpose programming language used for backend web development, whereas PHP wasn’t designed to be a general-purpose programming language. The paths to using PHP are many and varied, but the single most reason for sticking with PHP is its robustness and ease of use. Sagar Khillar. "Difference Between Python and PHP." DifferenceBetween.net. 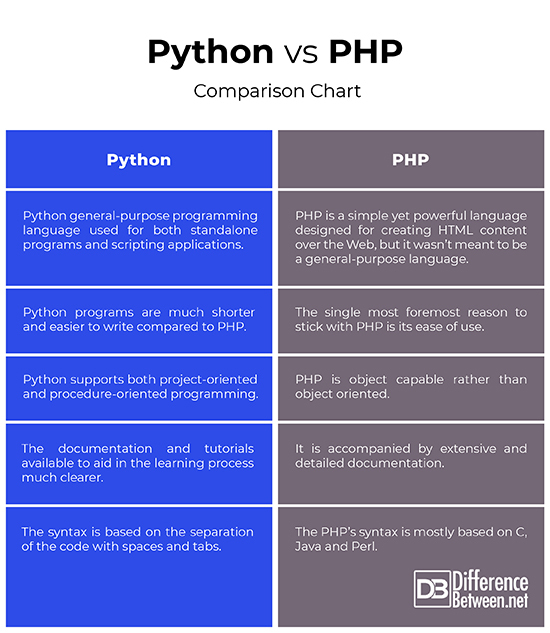 March 5, 2019 < http://www.differencebetween.net/technology/difference-between-python-and-php/ >.